WATERMELON: Trump Mumbles The National Anthem - Joe.My.God. Prior to the start of last night’s college football championship game between Alabama and Georgia, President Donald Trump took to the field to participate in the pregame singing of the national anthem. 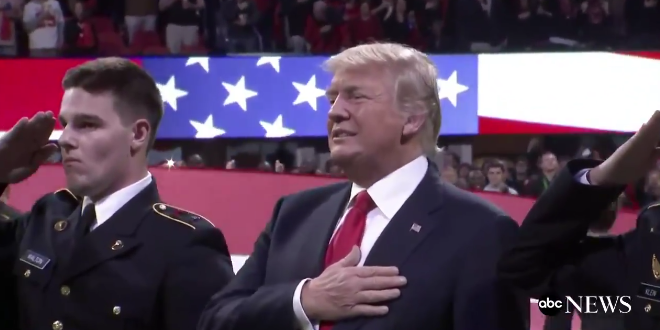 Considering that the president has made a really big deal about athletes showing respect during the playing of the Star-Spangled Banner, this presented the opportunity for Trump to stand on a football field, look towards the US flag with his hand on his heart, and sing along confidently as the anthem played. So, is that what happened? Well, take a look for yourself. Oh how I love you, @eddieizzard.